communication anymore. Traditional radio systems transmit signals from the controller to the receiver, but Telemetry-capable systems send real-time data from your model back to your transmitter. 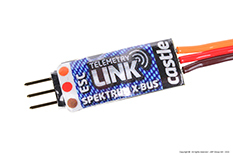 The X-BUS Telemetry Link was developed based on communication protocol disclosed from Spektrum® for use with specific Spektrum® radios and compatible Castle Creations ESC’s. Telemetry data can be displayed on the transmitter screen, or for parameters where you only want to be notified when a defined threshold is exceeded, (battery voltage, ESC temperature, etc.) you can configure a vibration or sound alert from the radio. The ESC must have the ability to accept a bi-directional communication protocol that gives it the ability to transmit real-time telemetry feedback. This feature is called Link Live™ and needs to be enabled on compatible ESCs using Castle Link™. Click here to view the Castle ESC Compatibility Chart. These selected radio’s support bidirectional communication. It is also necessary to utilize a compatible Spektrum Telemetry Module. Click here to view the Spektrum® Radio Compatibility Chart. You will be able to see the voltage state of your battery during flight and respond appropriately to deteriorating conditions or alarms you’ve programmed in your radio. Reduce the load (throttle usually) to prevent an over-current shut down and know immediately if your consuming too much current in a particular maneuver. This is the percentage of full power your ESC is delivering to your motor. Ensure you are within acceptable parameters, without the use of a tachometer. Monitor your BEC voltage and its stability to the RX even under different loads from different servos. ESC temperature monitoring can eliminate a potential thermal shut down. Just how hard are the capacitors, FETS, and internal components working with your set up, excessive ripple can cause internal heating of batteries. Excessive heat is harmful to the components and it can ultimately kill the controller. Operation of a model aircraft requires your undivided attention. We encourage you to refer to your transmitter manual to configure tactile and/or aural alerts to ensure your safety, and the safety of those around you. Let’s face it, your time and your energy should be devoted to enjoying your craft. Telemetry adds a whole new aspect to the RC pilot or driver that, when set-up and utilized properly, can take a lot of work load away and add to the overall satisfaction and safe operation of model airplanes, helicopters and cars. You can review compatible Radio’s and much more on the X-BUS Resource page.